Brother Dream Machine Innov-is XV8550D, is the latest Brother sewing and embroidery machine that has all the #1 rated features if its predecessor, The Dream Machine Innov-is XV8500D plus, even more possibilities than ever before. With more built-in designs, more fonts, more monograms, greater options for design creation, (even without the need of a computer). 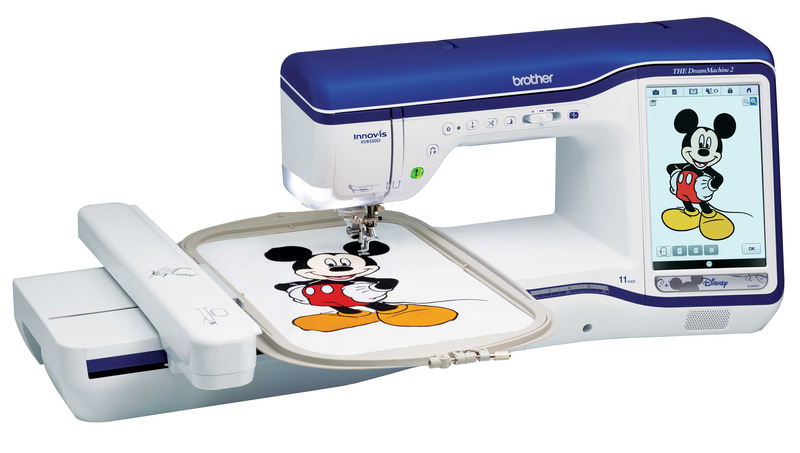 Also, the Brother Dream Machine Innov-is XV8550D has the greatest advancement in embroidery placement technology. The Dream Machine Innov-is XV8500D now comes equipped with Innov-eye™ 2 camera technology. With this amazing embroidery placement feature, embroidery placement is now done effortlessly and perfect every time. It uses a camera to perfectly align your design, even if you do not hoop it straight. This is a must for the embroidery enthusiasts and novice alike. Brother Dream Machine Innov-is XV8550D will even guide your sewing with Innov-eye™ 2 camera technology. It corrects your seam allowance as you go. You must see this machine to believe. The future of sewing, embroidery and quilting & crafting is here and now! Add more Disney, Pixar and Marvel designs at Ibroidery.com! Free guide classes with purchase, at any Moore’s SoCal locations. Click here for a list of upcoming classes. BES4 Embroidery lettering and editing software with 840+ built-in designs.